ADSelfService Plus supports Active Directory (AD)-based single sign-on (SSO) for BMC Remedyforce and many other SAML-enabled applications. When SSO is enabled for BMC Remedyforce, users only have to login once into ADSelfService Plus - the identity provider. After logging in, users can securely access their BMC Remedyforce account without having to enter their username and password again. ADSelfService Plus supports both Identity Provider (IdP) and Service Provider (SP)-initiated SSO for BMC Remedyforce. IdP-initiated SSO for BMC Remedyforce: Users need to log in to the ADSelfService Plus self-service portal first, and then click on the BMC Remedyforce icon on the Applications dashboard to access BMC Remedyforce. SP-initiated SSO for BMC Remedyforce: When users access BMC Remedyforce via a URL or bookmark, they are routed to the login page of ADSelfService Plus. After they log in, they will be redirected and logged into BMC Remedyforce automatically. ADSelfService Plus utilises the existing AD domain credentials for authenticating users during SSO. 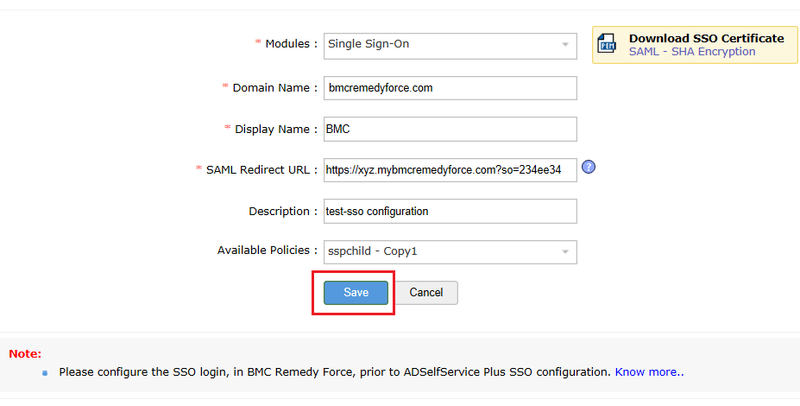 This makes the configuration of AD domains in ADSelfService Plus necessary before enabling SSO for BMC Remedyforce. Log in to ADSelfService Plus web console using admin credentials. In the dashboard which displays the list of applications supported by ADSelfService Plus, click BMC Remedyforce. In the pop-up that appears, copy the Login URL and click Download Metadata file to download the metadata file. Log in to BMC Remedyforce web console with admin credentials. Navigate to Setup → Security Controls → Single sign-on settings. Select the SAML Enabled checkbox and click Save. Enter a descriptive Name for the SSO configuration. In the Identity Provider Certificate field, click Choose File to upload the downloaded metadata file from step 12. The Entity id will be automatically populated. If not, enter https://saml.remedyforce.com in the Entity id field. 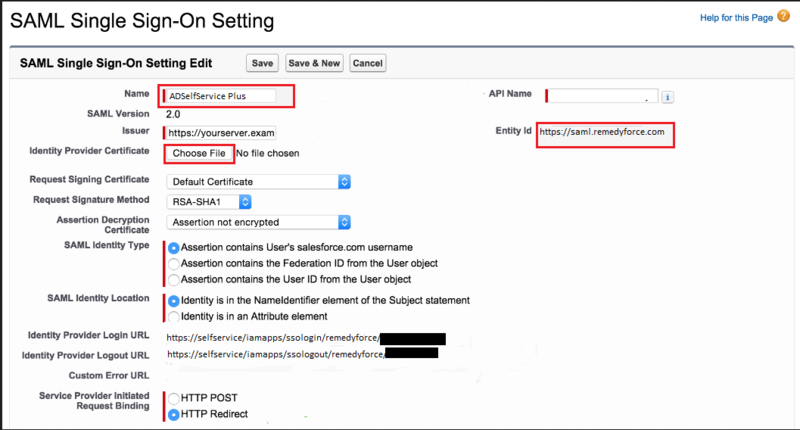 Copy the Salesforce Login URL from the Endpoints section. Go to Setup → Domain Management → Domain and then select your domain. In the Login Page Settings pop-up, select Edit. In the Authentication Service field, select the ADSelfService Plus checkbox and click Save. Now, switch to ADSelfService Plus’ BMC Remedyforce configuration page. In the Domain Name field, enter the domain name of your email address. For example, if you use johndoe@bmcremedyforce.com to log in to BMC Remedyforce, then bmcremedyforce.com is the domain name. Enter an appropriate Display Name. 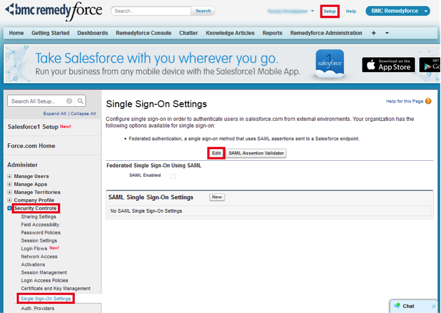 In the SAML Redirect URL field, enter the Salesforce Login URL from step 22. In the Available Policies field, click on the drop-down box and select the policies for which you wish to enable single sign-on. That’s it! Now users can log into their Evernote account automatically using single sign-on.